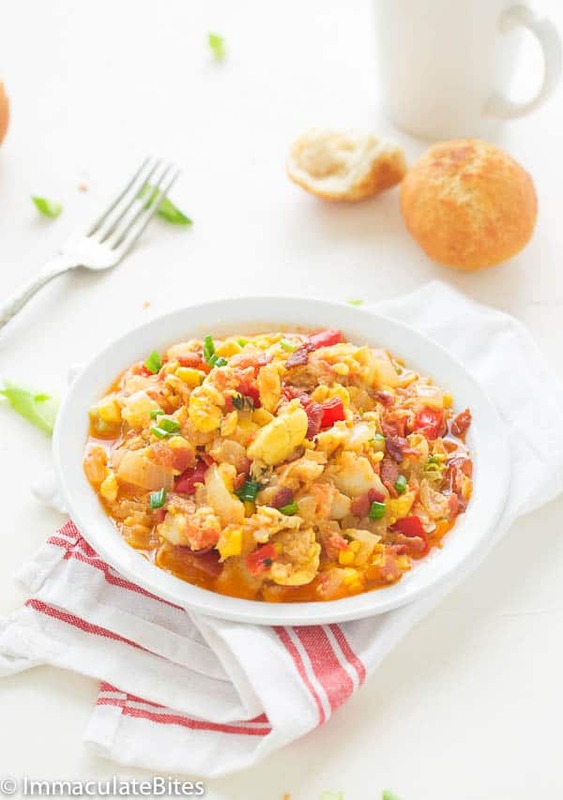 Jamaican Ackee and Saltfish – A quintessential Jamaican Breakfast made with Ackee, Salt fish with , onions, tomatoes, red bell pepper, then infused with garlic , thyme and hearty spices; satisfying a taste bud sensation. Soak salt cod fish in water overnight, if needed boil to get rid of excess salt. Set aside. Then remove bacon form skillet and transfer to a plate. There will be some bacon drippings left in the pan, remove and leave about 1-2 Tablespoons bacon. Add about 2 Tablespoons of vegetable oil to the pan. Followed by onions, garlic, thyme, and green onions. Sauté for about a minute, stirring occasionally to prevent any burns. Finally throw in salt fish, cook for a few minutes then add ackee and cook for another 3 minutes or more – adjust the seasoning to taste. Remove from the heat and let it cool. You may prepare this a day in advance.